James L. Ferraro along with Michael V. Kelley were the founding partners of Kelley & Ferraro, LLP which represent over 30,000 asbestos victims. Mr. Ferraro practices in the areas of product liability, wrongful death, personal injury, and medical malpractice. He has specialized in asbestos and mass tort litigation for close to twenty years. He has successfully tried many cases that resulted in multi-million dollar jury verdicts. In 1995, Mr. Ferraro received the largest compensatory award in the state of Florida for a mesothelioma case. In 1997, Mr. Ferraro also had the highest compensatory jury verdict ever in the nation for a non-malignant asbestos case. Mr. Ferraro has negotiated settlements on behalf of tens of thousands of clients in his years of practice. His negotiated settlements are close to a billion dollars. Mr. Ferraro was one of ten national finalists for Trial Lawyer of the Year in 1997 for trying the first case successfully prosecuted against a chemical company for causing a birth defect. Mr. Ferraro proved that a pregnant woman’s exposure to the fungicide, Benlate, caused her child to be born without eyes and held DuPont accountable in Castillo vs. E.I. du Pont de Nemours and Company and Pine Island Farms. The trial was covered in its entirety on Court TV and received worldwide attention. Seven years after trial, the Supreme Court of Florida affirmed the trial court verdict. Mr. Ferraro received a Masters degree in Accounting in 1979 and became a Certified Public Accountant in 1980; he also taught accounting at the University of Miami in 1982. He is a member of the Ohio, New York, Florida, and Massachusetts Bars; the American Bar Association; the Florida Institute of Certified Public Accountants; the Association of Trial Lawyers of America; the Academy of Florida Trial Lawyers; the Trial Lawyers for Public Justice; and the Million Dollar Advocates Forum. 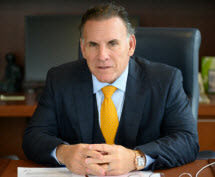 Mr. Ferraro is also the founding shareholder of The Ferraro Law Firm in Miami, Florida. He was the majority owner of the Cleveland Gladiators of the Arena Football League. He is also a Trustee of The William J. Clinton Presidential Foundation; a member of the Board of Directors of The Buoniconti Fund to Cure Paralysis, Inc.; a member of the Honorary Board of The Children’s Home Society of Florida Foundation, Inc.; a member of the National Leadership Committee of the National Italian American Sports Hall of Fame; and a member of the Advisory Board of the Make-A-Wish Foundation of Southern Florida. He was inducted into the Order of Saint John of Jerusalem Knights of Malta in 1999 and he was awarded the Ellis Island Medal of Honor in 2001. Mr. Ferraro has three children - James, Andrew, Alexis, Dmitri and Mateo.